The deal has become the subject of a legal challenge by UK Uncut, the tax pressure group. 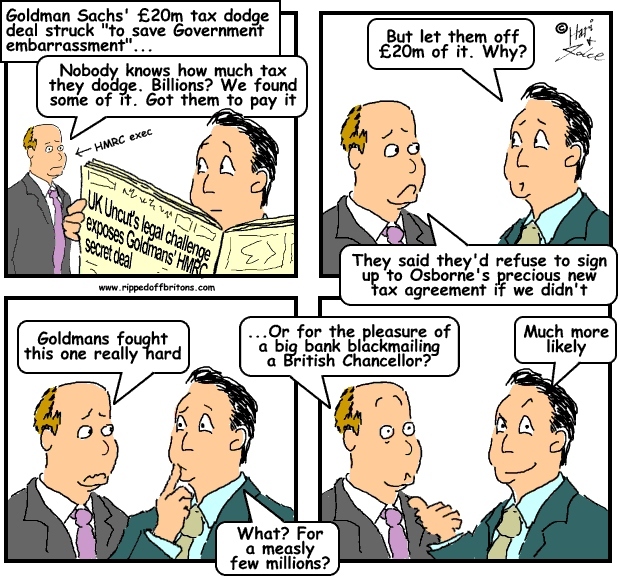 The deal allowed Goldmans to escape paying between £6m and £20m in interest on tax owed to the Exchequer. HMRC apparently feared that Goldmans would pull out of George Osborne’s new tax monitoring agreement unless it was let off the tax. UK Uncut wants the High Court to declare the deal unlawful, but even if it does so, the deal cannot be overturned and Goldmans will not be obliged to pay the money. The court saw incriminating emails by Dave Hartnett, who was the top ranking civil servant at HMRC at the time. Is Corporation Tax being cut to make us more competitive? Or is there another reason?